Stephen Davies: I have a strong feeling that Hip Tung Wo Engineering Works may have been involved in the building of German design diesel engines under Japanese supervision at Taikoo Dockyard during World War Two. Three of these were acquired after the war, I don’t know how, by Mr Fu Tak-iong who had got in on Macao gambling pre-war. 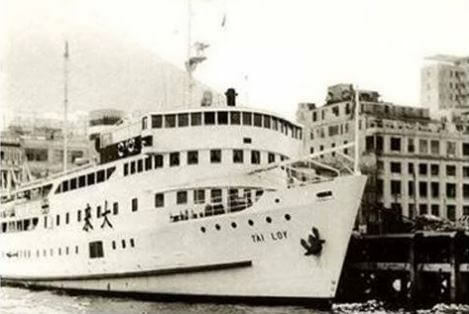 To boost business post-war Fu, (he was eventually ousted by Stanley Ho in 1952), had built by Wing On Shing Shipyard the first steel vessel to be built in HK after WW2, the motor ferry Tai Loy, (later being renamed the famous Chung Shan that older folk will recall being the last overnight ferry to call in at Porto Interior, Macau – she came out of service around 1976). This photo below shows an almost ready for service Tai Loy and comes from the excellent Flickr site of Fong Lai-kuen. Please see the link below for the original which is massively zoomable with fantastic detail and showing a much larger area of Kowloon. 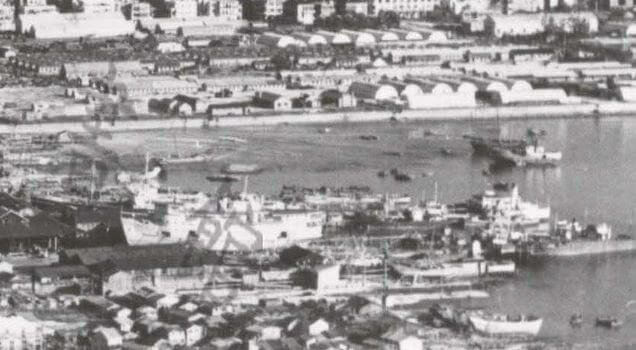 The detail below from a photo is labelled 1937 though Ray Luk has left the following comment: This Photo was not taken in 1937 because as you can see that construction of the Hong Kong Macau Ferry Tai Loy was still being built at the Wing On Shing shipyard. This Photo should be taken around 1949-1950 as the ferry Tai Loy was nearly finished and to be launched. She was laid down in 1948, launched in 1949 and went into service in 1950. To power her Fu Tak-iong insisted on using the three, Hip Tung Wo engines. She was therefore a triple screw motor ferry which went against his naval architect’s advice. The architects and Wing On Shing majority owners were the family of HK’s first Chinese Director of Marine, Peter Chen. Macau Ferry Terminal, HK. Date unknown. The HK Maritime Museum has a very nice contemporary builder’s model of the Tai Loy, donated by the Chen family. This article was first posted on 19th July 2016. Great article but a minor correction – Fu Tak Iong should be spelled Fu Tak Iam (傅德蔭, there is a foundation in his memory – http://www.ftifoundation.org) who was better known by his nickname Fu Lo Yung (傅老榕). He jointly held the gambling monopoly in Macau with Ko Ho Ning from 1937 until his death in 1960 and their descendants lost the gambling license to the consortium led by Stanley Ho in 1961. York Lo is correct, Fu was not ousted by Stanley Ho but lost the Gambling monopoly licence to Stanley when the latter built the new Hotel Lisboa and brought in a new Consortium of Fok Ying Tung, Teddy Yip, Yip Hon and Ho to secure the new tender.